Hachette Children's Group has announced its acquisition of Body Brilliant: a teenage guide to a positive body image by Nicola Morgan, who has written extensively on teenage wellbeing. The book will appear under Hachette's Franklin Watts imprint, which will publish in July 2019. The deal for world rights was brokered between managing editor, Victoria Brooker, and Morgan's agent, Elizabeth Roy. This new deal for Morgan follows the success of her book Positively Teenage, which published this year. 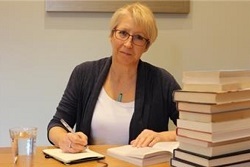 Brooker said: "I'm delighted that Nicola has agreed to do a follow-up to Positively Teenage; Nicola's expertise in writing for and about this age group is well-known and well-respected. Body Brilliant will be a fantastic resource for both teens and their parents. Children are bombarded with information and images – through the media and their peers – about themselves, and it's often very challenging to navigate." Morgan said: "I'm very excited to be doing Body Brilliant with the team at the Hachette Children's Group. Body image is such an important and fascinating topic. I'm so looking forward to sharing the science and understanding with young people and their parents, and it's a perfect partner for Positively Teenage."